Whether you’re grieving the loss of a loved one, curious about what happens when we die, or pondering your own mortality, this book offers perspectives that are well thought out and simply stated. 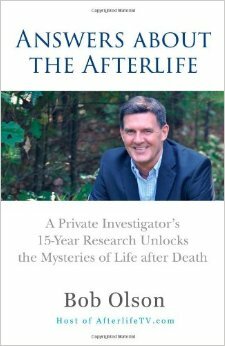 “Answers About The Afterlife” is available in Paperback or Kindle eBook: click here. Bob Olson’s new book, “Answers About The Afterlife,” is an excellent read. Like his interviews on Afterlifetv.com, Bob’s book is genuine and engaging. He presents his ideas and conclusions with an organic logic, making potentially challenging concepts simple to digest. Answers About The Afterlife stretches beyond belief systems respectfully, eliminating competition and resistance, setting the reader’s own curiosity free. Bob’s work is a true inspiration to keep asking the questions that matter. What happens when we die? This is one of humankind’s most important and enduring questions. “Answers about the Afterlife” brings a fresh and exciting perspective to this ancient question. Bob Olson presents an impressive compilation of many lines of evidence that converge on the conclusion that the afterlife is, in a word, real. Innumerable common questions about the afterlife are addressed. This book is well written and enthusiastically recommended. Congratulations Bob Olson. Your book: ANSWERS ABOUT THE AFTERLIFE is perhaps one of the most in-depth and comprehensive guides I have ever read on the subject of life after death. I would call it the encyclopedia of the afterlife. This should be required reading for every soul who has ever pondered their heavenly heritage. Bob Olson has taken his education, experience and passion for being an investigator and applied them to the study of the afterlife, death and dying, and the world of spirit, sharing what these topics can teach us about life. This book is a wonderful map for those seeking their own discoveries as they explore the infinite possibilities. What a useful book. This is a clearly laid out resource, carefully researched and well thought out. Each topic is considered and approached in a logical and balanced way, and explained in sufficient detail to answer the questions fully. If you want one book to help you understand everything that has been found out about the afterlife, this could be it. This is a wonderful book that will change the lives of enquirers in this area, who may well be bereaved and lost and lonely, they can rely upon Bob’s vast exploration and understanding to guide them on their journey. Bob is a colossus in his field and is respected worldwide and this book demonstrates why. I recommend it wholeheartedly to you, as Bob will heal both worlds with this genuine and detailed investigation.